Thrilled by Toothless? Scared of Smaug? Need a ‘mother of dragons’? Remember Hogwarts and the Hungarian Horntail? Now meet the woman from a department so secret, even British spy bosses don’t know it exists: DCHQ. Dragon Conservation Headquarters. 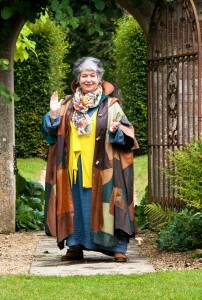 She’s code named Agent Green, her costumes are fabulous and she’ll make a flying visit to your event / venue. 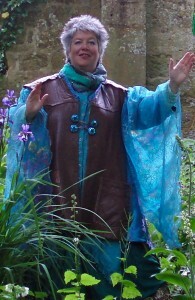 Contact DCHQ now to book this gloriously costumed entertainer for your FantasyCon, festival, castle, arts centre, exhibition, show garden, village hall or school. – Children’s edition: storytelling for age 6-12. Swashbuckling Dragon Tales brilliant for boys, great for girls, even accompanying adults enjoy them. Genuine all-the-family entertainment. – Fantasy edition: story cabaret show for age 16+ only. More swashes, more buckles, generally more leather; and happily-ever-after can’t be guaranteed! Walkabout with Bitey Bob the Hatchling dispensing dragon management advice – and having tricky moments as she tries to socialise the 16-week-old dragon hatchling… She might call herself a draconics expert but she’s not very good at controlling him! – Age appropriate editions as above. 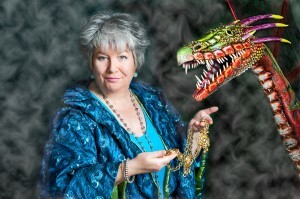 Masterclass in the Care & Training of Dragons for young adults and fantasy fans. The world’s only living dragon whisperer delivers a spoof lecture in perfect professorial style; with very funny audience Q+A. Dragon Adventure Day: One of our Dragons is Missing. Scenario: Agent Green needs your help. One of the new Hatchlings has escaped. Invent a techno-magical dragon tracking device and help Agent Green as she follows a tricky trail of footprints, scorched leaves, shed scales, drakkenmark symbols and even dropped treasure. Keep your cool and earn your Dragon Apprentice badge! Requires a safe outdoor location with weather shelter. NATIONAL DRAGON DAY 23 April annually reveals the TRUTH about that vulgar medieval thug George, who went around provoking honest dragons into fights… Stories, making, tracking expedition, survival tips and more! How to survive your first encounter with a wild dragon … Stabling and feeding … Techno-magical devices and clothing … What to wear for formal meetings with dragons. Plus important first aid such as What to do if your dragon’s flame goes out. Dragons can be difficult friends… but they are superb storytellers. Through long winter nights, warming her with hot coils of tail, Agent Green’s dragon companion has told her fantastic legends and folktales from around the world. And he’s given her permission to tell these stories everywhere. The result is DRAGON TALES – now available on spoken word CD and as an illustrated e-book. The DragonProof Cloak is a techno-magical garment that protects the wearer against dragon fire. More or less. Raised by a grandmother with fairy ancestry, she was first introduced to wild dragons by her godfather – a top Cambridge academic who went rogue. While still at university, Agent Green was recruited to DCHQ Cheltenham – not to be confused with the spy base in the same town. For more than 20 years she has been vital to the Department’s top secret work. Her first name and the truth about her birth remain closely guarded secrets. All we can reveal is that her mission is to find and save the world’s last dragons. ‘Agent Green’ is a stage persona of Chloë of the Midnight Storytellers, the Cotswold based spoken word artist, slam poet and writer. As a walkabout character and in shows, she portrays a fantasy secret agent whose mission is to help conserve a highly endangered species. Chloë learned stagecraft at London’s Central School of Speech & Drama. In her first career she worked as a copywriter in public relations and marketing, and presented solo 1-day training seminars to large audiences throughout the UK and overseas. She discovered live storytelling in the early 1990s, retrained with the UK’s most respected storytellers and turned professional in the winter of 1999. "I LOVE AGENT GREEN! She came to our school and I went to her show, she's AMAZING. How old d'you have to be to become an Apprentice Dragon Whisperer?" 'Adventures of a Dragon Whisperer' - the career case notes of Agent Green. Funny, heartrending, fierce!